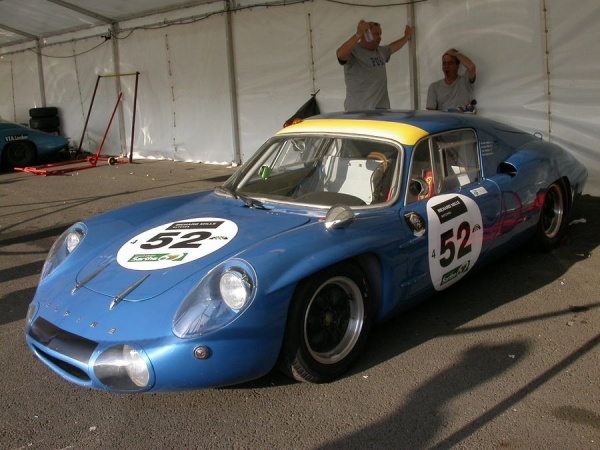 It seems like the installation of brake calipers and rotors of an R16, instead of the original R8, at the front of an A110, was offered as an option by the Dieppe factory on the 1969, 1300S. The rear brakes stayed the same with the original R8 equipment. After that, as mentioned in the PR 871, Matra Bagheera rear brakes were offered as a Group IV option for the 1600S, together with replacing the 19mm master cylinder with a 22mm. The description of these changes was presented in the (old series) Mille Miles #11 and #12 from 1987. Unfortunately, those are very hard to find now a days. Our experiences with this front brake set up on a 1600S, conserving the 19mm master cylinder, are very positive. It's the subject of this technical article. The original set-up used R8 calipers with a piston diameter of 38mm (an 11.3 sq.cm surface) at the front and 32mm pistons (8 sq.cm) at the rear. The bigger diameter at the front is needed, due to a characteristic of all automobiles, the transfer of masses under braking. Under serious braking, a driver's leg will apply a force of 30kg on the brake pedal. This force is mechanically multiplied by five through the lever action of the pedal; so a force of 150kg is applied on the master cylinder. A 19mm. master cylinder (surface 2.7 sq.cm) will reduce this force to approx.56 bars (150/2.7) applied to the whole hydraulic system. This pressure creates a total braking force of 56x11.3=624 kg at the front caliper and 56x8=448kg at the rear calipers. With the same pressure of 56 bars an R16 caliper (D=48mm surface 18sq.cm) will create a braking force of 56x18=1008 kg, causing an obvious advantage: an increase of 40% in braking power. A secondary advantage is the use of thicker rotors; 12 mm instead of the original 8mm(the diameter of both rotors is the same, D=250mm). While dissipating a certain amount of energy, more massif rotors will stay cooler. A last advantage, is the bigger amount of brake liquid in the brake calipers; here again more liquid means less heat. These improvements have two disadvantages; more un-sprung mass and a longer stroke of the brake pedal, caused by the increased amount of brake liquid that has to be displaced. Luckily these two theoretical disadvantages do not cause any practical inconveniences. At each side of the front end we will replace the caliper, the rotor, the brake hose and the caliper bracket. A centralizing big washer is needed plus six Allan screws (see below). The new rotors are standard, non-ventilated R16 parts, 12mm thick with a 250mm diameter (approx. FrFr. 250.00 a piece). The new calipers and cast iron brackets are standard R16 parts as well, avoiding the very first R16 series. Those were directly derived from the R8 brakes, and as such useless for this procedure. The alloy calipers have hollow pistons without an automatic take-up system. They are easier to take apart. To change the rubber seal one only has to push the piston out by using compressed air. Two bolts (threads M12x1.25) mount the caliper bracket to an alloy flange (FrFr. 850.00 for a set of two). The flange itself is fixed to the stub axle carrier with the four original square bolts. At the same time of the transformation to the big brakes it is advisable to change the original rubber brake hoses to "aeroquip" hoses. These virtually don't expand, as the original hoses tend to do, thus eliminating the spongy feel of the brake pedal. See note at chapter "Horrors of an A110"
Take out the exterior hub bearing and the hub with the rotor. Unscrew the four square bolts (8mm.) that hold the caliper bracket and take it off. Check if the flanges are fitting correctly. It is often necessary to remove a little metal with a power file, to get a perfect fit to the hub. Check the same thing for a perfect fit of the flanges with the caliper brackets and the two 12mm bolts. Unscrew the three nuts (M10x1.25) that hold the rotors to the hubs. The center holes in the R16 rotors are bigger (84mm. for the R16, to 60mm. for the R8), so we need to mount an adapter to center the rotor on the hub. This adapter can for example be made, using an old R8 rotor, by cutting (on a lathe) a bigger hole with an 84mm. diameter. When you try to ensemble the rotor with the hub, it occurs the three holes in the rotor do not correspond with the bolts on the hub. They are situated a little too far to the exterior so you're not going to use the original holes. You have to drill three new holes about 30mm. from the old ones. These holes (D=10mm.) are drilled without any difficulties. The original holes are counter sunk at about 4 mm. deep, so the rim rests flat on the rotor. Of course you can make the counter sink holes yourself with an 18mm drill bit, but it's preferable to have it done by a machinist. To keep the centering adapter in place we need to make six 1mm thick, 13x15 mm steel plates. A 10mm hole should be drilled somewhat out of center of those plates. The retainer plates are mounted on the inside of the rotor with Allan bolts with a low head (D=10mm. L=25mm) and a lock washer. Assemble the flanges, caliper brackets and rotor. The only adjustment to be made is the parallelism of the caliper bracket and the rotor. Centering is not necessary since the caliper moves freely in the brackets and centers itself. If needed use the old original shims to adjust by putting those between the hub and shim plate. The brake hoses are all 3/8(no metric sizes available). A Banjo or 90 degree connector is mounted on the bracket to connect the new brake hose. Bleeding of the brakes isn't any different from normal. The improvement of braking after this alteration is spectacular, as well is the lasting of the brakes. After experiencing the difference, you ask yourself how you were ever able to slow down, before changing to the bigger brakes. Start with changing the brake pads at the rear with racing front pads (CAR IDF). Changing to bigger rear brakes requires machining of new rotors and changing to a bigger size master cylinder. It w0ould be interesting to see how the brakes would perform by replacing the rear calipers by the old front calipers (38mm instead of 32mm). Of course you'll have to disconnect the hand brake (or go with a hydraulic one YB).